(New York, NY, February 11, 2014): On Tuesday, February 11, 2014 at 6:00 p.m. 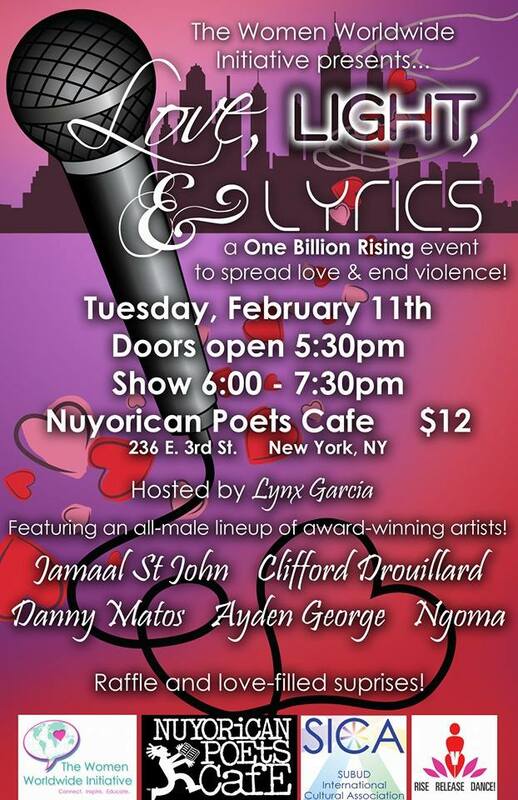 ET, The Women Worldwide Initiative (TWWI) will host its annual Love, Light & Lyrics Showcase, in conjunction with activist Eve Ensler’s global One Billion Rising campaign, at the iconic New York cultural and arts space, the Nuyorican Poets Café, in the Lower East Side of Manhattan. Love, Light & Lyrics will showcase performances by acclaimed vocal artists to engage the community on the topic of gender-based violence. The evening will be hosted by radio host Lynx Garcia and feature the following artists: The Peace Poets, Ngoma Hill, NYC spoken word legend and former member of the Spirit House Movers & Shakers with Amiri Baraka, Jamaal St. John, 2008 Nuyorican Grand Slam Champion, Danny Matos, 2013 Poetry Idol, Clifford Drouillard, Co-founder of the Brooklyn College Poetry Slam Team ranked second in the nation, and Ayden George, singer and songwriter for Vivian Green and Kelly Rowland. “This event is our community’s call to spread love and end violence,” says Founder and Executive Director, Uraidah Hassani. “This year, with an all-male lineup, we are focusing on engaging men in the discussion on how gender-based violence affects our community and what actions we can take to prevent violence.” Curated by TWWI, the Love, Light & Lyrics event raises funds for TWWI’s Young Women Rock! Mentorship Program, which tackles issues including domestic violence and conflict resolution with women and girls in low-income communities in NYC. One billion activists in 207 countries and territories came together last year in the biggest mass action in human history, to demand an end to violence against women and girls as part of the One Billion Rising campaign. This year, we will focus on the issue of justice for all survivors of gender violence, and ending the rampant impunity that prevails globally.